Along with the tweets, there were release parties and events, and stories of folks who travelled quite a ways to get a taste of the once a year brew. In areas the it didn’t make it to, I’m sure plenty of beer related conversations this week at least touched upon its reputed taste, aroma, or the fabulous looking head a freshly poured one exhibits. This type of commotion, of course, is not unheard of when it comes to these kinds of beers. Now, American craft beer is a jungle full of interesting, delicious, and excellent brews. But as any jungle explorer worth his fedora will tell you, there are a few handfuls that tend to gain the kind of king of the jungle respect that gets you your own release party. What separates them? Think big. No, bigger. Ok, bigger still. Sure, being released on an annual basis for limited runs may help a beer’s notoriety, but typically these kinds of brews have been imbued with much bigger than typical flavors, which often means more (or more costly) ingredients, which in turn, helps explain a once a year release and a higher than average price. So while you think “big”, think also…intense, and complex. With some of the most notable, let your mind wander to descriptive terms like mind blowing. Some of these beers, you’ll remember when you first had them, and where. Now, not all are quite this epic, and of course opinions vary on which ones to include on the red carpet list. There are also many others that seem to come close to earning such excitement. These brews have their own, smaller packs of groupies, are available readily, but still feature some pretty intense, much bigger than average flavors. 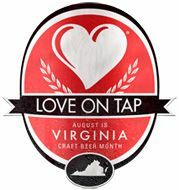 This weekend, here in Roanoke, we’re lucky to have representatives from both “categories” around town, on tap, and are all well worth checking out. Be wary though, a couple of these are definitely hop forward. So if you’re a self appointed hop head, you’ve skipped to the list below, have your coat on, and are headed for the door. But if you are still skeptical of hops and how much tongue and face twisting they’ll do to you, you might tend to stay away from these particular animal’s cages. Then again, perhaps today’s the day your curiosity gets the best of you, and you earn your very own fedora. BLUE 5 RESTAURANT: Happy hour yesterday found the crew at Blue 5 tapping a small barrel of Foothills Sexual Chocolate. How long it’ll last is anybody’s guess. From the Foothills website: “A cocoa infused Imperial Stout…big chocolate aroma with notes of espresso, blackstrap molasses, dark sweet toffee and dark fruit…smooth dark chocolate backbone (taste) with notes of coffee, dark toffee, and dark fruit”. Tonight however, Blue 5 will apparently be tapping some of Avery Brewing’s (CO) amazingly complex Imperial/Double IPA “Maharaja”. This is good example of a “big” time beer, and personally, I recall where I was and what I was doing the first time I tasted it. It features an intense collection of what Avery refers to as “vibrant” and “pungent” hop flavors, grapefruity over most others, but is balanced out with an “insane” amount of malt. There are tons of good beers out there, few that make you have one of those “wow…this…this is beer?” moments. For me, this is one of them. LUCKY RESTAURANT: Right now, Lucky has one of my favorite all time beers, Oskar Blues’ G’Knight Imperial Red Ale. This one is also pretty well balanced out between a generous amount of caramel sweetness from the malt and a bunch of what hop heads love to call (and the brewery as well) “sticky”, or resin like hop flavors, making you want to smack your lips to it’s grapefruity, tropical fruit like flavor. The two sides battle it out in this beer which is big on both, a hop lovers delight, and for those not certain on hops, a good beer to test your resolve with. LOCAL ROOTS RESTAURANT: Local Roots continues to have another of my personal favorites, Breckenridge Brewery’s “Small Batch” 471 Double India Pale Ale. Here’s still another hop heavy beer whose malt sweetness matches up well to the hop flavors and bitterness, but with the hop side of things taking the lead. Grapefruit and orange, pithy tastes and a definite warming effect from the alcohol are all here, along with a mid-heavy body. ~ by thebeerroad on February 17, 2012. I also remember my first taste of Maharaja. It was on tap at Naja’s Place in Redondo Beach, CA. I was a burgeoning hop head/craft beer fan and I had just had my first (and only to this day, sadly) Pliny the Elder on tap. The Maharaja quickly became the second best beer I’d ever had…the Pliny being the first.